Today I’m a guest of Anna’s at the Diary of an Eccentric blog. I talk about how my new novella, When Mary Met the Colonel, taught me something about myself. There’s also an excerpt and a giveaway! Janet at the More Agreeably Engaged blog is generously hosting my guest post about When Mary Met the Colonel. My post explores the idea of “opposites attract” when it comes to Mary Bennet and Colonel Fitzwilliam. There’s also an excerpt and a chance to enter a giveaway for the novella! Five Star Review and Giveaway of The Secrets of Darcy and Elizabeth! 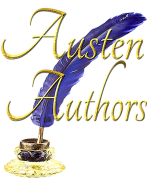 As part of her “Jane Austen and War” series on the blog JustJane1813, Claudine is doing a giveaway — and wrote a lovely, five-star review — of The Secrets of Darcy and Elizabeth. Check it out!